HOTTEST HAT OF THE SEASON!!! Who doesn't love knitted beanies, right? And when you get one with double pom pom detailing; it's something no one can resist! Your baby will stay extra warm and cozy during fall and winter with this beanie. Be ready to bundle up in our soft cotton knit that features two detachable fur Pom Pom ears..
​the pom poms are mixed color, colors sent at randomly. This hat size information is just for reference only. You may return most new, unopened items within 7 days of delivery for Store Credits ONLY We'll also pay the return shipping costs if the return is a result of our error (you received an incorrect or defective item, etc.). If you need to return an item, simply login to your account, view the order using the "Complete Orders" link under the My Account menu and click the Return Item(s) button. We'll notify you via e-mail of your STORE Credits once we've received and processed the returned item. Please also note that the shipping rates for many items we sell are weight-based. The weight of any such item can be found on its detail page.To reflect the policies of the shipping companies we use, all weights will be rounded up to the next full pound. 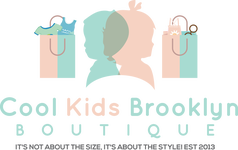 © 2019 COOL KIDS BKLYN BOUTIQUE LLC All Rights Reserved. THE COOL KIDS BROOKLYN GANG. VIP sales. New arrivals. Special events.